Trust which includes character and competency is the foundation of any relationship. Ability to establish trust is extremely important for any process and should require maximum attention. Because it is the trust that allows us to remove our barriers and bring openness and honesty. 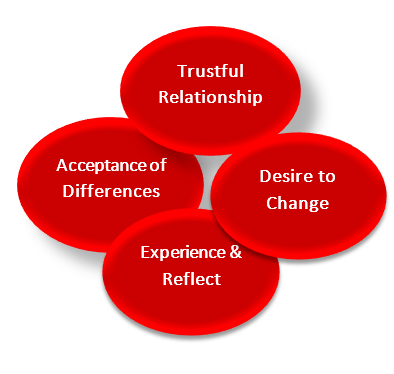 Accepting that what we believe to be true (the values, norms and assumptions that matter to us) – does not necessarily have to be true for others is an important precondition for any effective human interaction. We are all different and come from different backgrounds. Acceptance does not mean agreement. It just leads to the understanding that there is not one way of doing things but that we can learn from each other. Change is the only way that frees us up from the point that we get stuck. It is an ongoing process that gives us the opportunity of knowing ourselves better and gaining new perspectives. This allows us move from the point where we are to the point where we aspire to be. The only question is how willing we are to start. Most of the time we give up without giving a try. What prevents us from experiencing something new is our assumptions and the contexts that we have in our brains. This avoidance may help us stay in our comfort zone. But on the other hand, it eliminates the opportunity of learning whatever the outcome is. What enriches our life are our experiences and learning from them.